The Superlux S241/U3 is a deluxe interchangeable capsule small diaphragm externally polarized condenser mic. It is similar in this regard to the Schoeps Colette series and the original AKG C451E series. The current AKG C451B was made without interchangable capsules and has an electret capsule as a cost saving measure. The S241/U3 comes with a cardioid capsule, but pairs of omni capsules are available. It has a switchable attenuator with 0, -10, and -20 dB settings to allow use in extreme level applications up to 143 dB SPL. There is a switchable low cut filter with flat, 75 Hz and 150 Hz settings to allow rejection of room rumble and unwanted low frequency pickup. 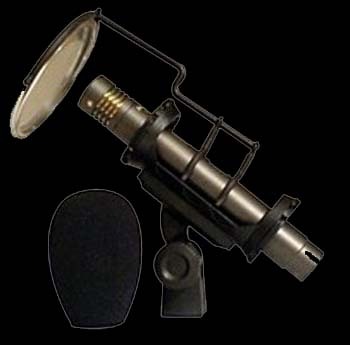 It comes with a foam windscreen for outdoor or handheld vocal applications, and a micro-perf metal pop filter for studio vocal applications. A shock mount is supplied, and the whole kit comes with a hard shell plastic carrying case.